Rhododendrons are beautiful when planted in masses. After many years of growth they can even be trimmed into a hedge or screen. They make a lovely backdrop for spring bulbs and ferns. Used as shrub borders and foundation plantings, they offer a stunning show. Their handsome, dark evergreen foliage provides welcome winter interest. They combine well with oakleaf hydrangeas, bottlebrush buckeye, Kousa dogwood and magnolias. Smaller rhododendrons will grow in containers. Be sure that they have holes in them for drainage and are large enough. Certain rhododendrons (Rhododendron nakaharai and hybrids of Rhododendron keiskei) are ideal for groundcovers. A good rock garden choice is ‘Cloudland’ rhododendron (Rhododendron impeditum). 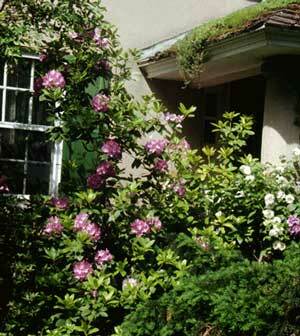 Forcing: Rhododendrons can be forced to bloom prematurely indoors in late winter. Cut branches tipped with swollen flower buds in February. They will bloom anywhere between 3 to 6 weeks depending on the variety. They will last in a vase from 5 to 10 days. The closer you cut the branches to the normal time they bloom, the more quickly they will bloom in doors. Use proper pruning cuts when harvesting the branches to preserve your shrub’s shape and health. Split the cut ends of the stems and put them in water immediately as described above for already flowering branches. Set them in a container of very warm water overnight, then replace the water with cooler water and set them in a cool, light room, replacing the water with fresh every 3 or 4 days. When the buds swell and show color, trim the cut stems ends and arrange them for display in a bright, warm room. Do not set them in direct sunlight.